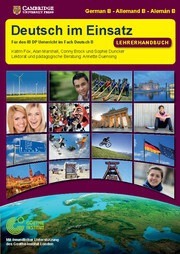 Tailored to the 2013 IB Language B syllabus, our full-colour coursebook, Deutsch im Einsatz, contains everything you need to succeed in your two-year German B course. The teacher's book provides answers to all the questions in the coursebooks and specific advice on tasks aimed at Higher Level students. The teacher's book explains the pedagogical aims of each exercise and provides additional activities that complement the exercises in the coursebook. A full chapter dedicated to the Written Assignment helps teachers prepare their students for this part of the examination. This chapter is now updated to match the 2013 syllabus requirements (first examination 2015). Werbung: Spaß, Verdummung oder Manipulation? 3. Soziale Beziehungen: Was ist der Jugend wichtig? Die digitale Welt: das goldene Zeitalter der Digital Natives? Schule: für das Leben lernen? 7. Freizeit: Musik heute, Fußball - eine Männerdomäne? 10. Textsorten - Beispiele und Checklisten.